Newcastle bid for Sochaux striker Modibo Maiga | NUFC Blog. 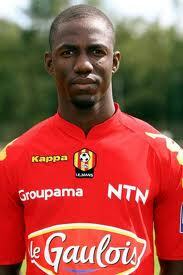 Newcastle United have allegedly made a bid for Sochaux striker Modibo Maiga. According to Sky Sports we’ve put in an €8m (£7m) bid for Modibo Maiga who is reported to be ‘unsettled’ at French outfit Sochaux. Part of the reason he’s unsettled is, it seems, because he wants a transfer to Newcastle but his club are refusing to acknowledge his desire to leave. “Before the Newcastle offer I have not been offered anything, but now I would like the chairman to consider my interest. I want to leave. “I met everyone at Newcastle. They want me and it is not just any club. Premier League is a dream. “That is the kind of game I like, it suits me and it is good for my career. I want to leave, he has to accept that and negotiate. “Offers have now come for me and the chairman refused to talk. “It was the very first time I asked for something and I believe it is lack of respect. Why refusing to talk? It is selfish, I can’t understand. Quite how this will pan out is anyone’s guess but he certainly seems keen for a transfer. Modibo Maiga is a 6ft 1in, 23 year-old striker from Mali who is also comfortable playing on the wing. His senior career began at Mali’s Stade Malien and he then transferred to Moroccan side Raja Casablanca. In 2007 he began a 3 year stint with Le Mans, scoring 15 goals in 88 appearances and since 2010 he has been at Sochaux where he’s netted 15 times in 36 league appearances. He also has 3 goals in 16 games for Mali. Haven’t found any sort of compilation yet, but if I do I’ll post it. I dont like this whole “let me go or I’ll stamp my feet until you do” attitude though…. Just what we need, a player who goes on strike just because another club put a bid in for him. You mean just like Ben Arfa? You seem to br in better fettle now Hugh, take it you had the first G&T at the crack of eleven! Trust Tarquin’s settled down otherwise you may have to get onto Joey, our very own mentor to the world to give him a little motivational therapy!!! Pimms at 11 dear boy! Aye, that is a point ToonArmy1. i hope this isn’t decka lamearse’s youtube recruitment drive. hugh i looked at this footage before,then i remembered the dennis wise situation. Many have asked the same question throughout history. @ 1 the stomp my feat attitude got US Ben arfa. So I’m no complaining. Although we did lose Carroll, Enrique, insomnia , ginola, tino, baye etc. The same way. So its about time we got a little bit back don’t you? another player with plenty to say for himself – could give wor joey a good run for his money if we sign him. worky @ 10 – why indeed? Similar style of football, 1/3 of english people/language are/is french. Quick flight hyem for a break? Well done to Ryan Taylor on saturday, he didn’t let us down in a very unfamiliar position for him. Aye, he got turned a couple of times, but a clean sheet is a clean sheet & he contributed well to that. Well in Raylor, good lad. Our scouting network is all over Europe. However, Carr (who has prove to us, and importantly the board), is based mainly in France, or at least his contacts are. So it make sense that we are getting players in from there. What usually happens with other places around Europe, our other Scouts recommend players for Carr to ‘double check’ – this is a slower process. Watching the game on Saturday, it looks like we need a supporting striker and not a target man, because we don’t currently have a quick, linking support striker. So…maybe yes, if he can fill that role. We need to play either 4-4-1-1 or not play 2 target strikers together (e.g – Amoebi/ba, Ba/Best etc etc). “Our scouting network is all over Europe. However, Carr (who has prove to us, and importantly the board), is based mainly in France, or at least his contacts are. So it make sense that we are getting players in from there. Where did you get all that from Dreamer? i think that’s HBA’s role when he comes back mate. Though, i’m with you, we need a quick, LCG striker. Well done to Gabriel Obertan too. Didn’t look out of place, has some great speed about him. When he settles can’t wait to see some skills too. Now he’s got his debut outta the way, that should be just around the corner. I tell you why France, same as why we are looking at Dutch players. Ashley is too tight to finance any trips abroad that cost more than £32.50 plus an evening meal. Does it matter its France or Dutch? We are getting quality in. Or would you rather us spent silly money on English (or British) players? Curious to know that if we got a striker through the door, would people be happy with the transfer window? We have a lot of unknowns, but compared to Everton, who have yet to sign anyone and Arsenal who are looking like they are losing three top players – Fabregas, Nasri and Eboue we are probably doing ok, aren’t we? Plus I hear the training ground is getting some new urinals and Ashley has bought the groundsman some new sponges. How many players have Everton lost though Micky? Most people as I do are probabaly thinking, who on earth s this, and a total rabbit out of the hat situation, hopefully this is another great spot by graeme carr and could make a big impact as tiote did, lets hope so anyways! Dreamer @22, you say it’s quality, we are being told they are quality, but I’ll wait and see as none of the guys have ever played in the PL. Personally I’d like to see us splash out on Sturridge and be done with. There’s 15 in here, but(s) you’ll have to pick the bones outta this. Didn’t everton lose a couple down between the fridge & the cooker? We didn’t lose anyone, they left on their own volition. Clint – Is that Llambias without his glasses at 30 seconds in? Only players that wanna be here. could be mate, doesn’t the commentator even mention it? Seems to knaa where the goal (but) is. Clint, players aside, have you evert stopped to think why no managers of any repute want to work here, despite the fact that we are one of the largest clubs in the League? Ditto comment 27, I think we are all hoping for another Tiote. He (Maiga) looks as if he scores a lot with his head, two footed as well, could be a good buy. we have about 15-20 years of sacking managers experience. Then the whole kk debacle, that’s gonna take a few more years of rebuilding a rep, or building even. That’s why i think we should stick with a manager for a few years, regardless. AP has 5 more years, if he can keep us relatively happy & in the meantime, keep his bosses relatively happy whilst the club settles, it could/would/should have a decent knock-on effect when it comes to recruitment of managers. More & more turmoil will only add to a bad job & make it worse. That’s my take on it, for what it’s worth. I’m still very curious about all the myths that have been put about by the club over Graham Carr and his almost mystical ability to ‘spot’ players, especially one who had been spotted anyway like Tiote. Is it a cunning PR effort to marginalise the role of the manager since the Keegan affair, the Hughton affair, and the fact that no-one good wants to manage us any more? worky – we are a poisoned chalice, simple as that. We have very high expectations of anyone who comes in. People have often stated it’s the impossible job. I don’t think it’s impossible, but there was only one time that all circumstances came together at the right time and that was when we had Hall Snr and Freddy Fletcher running things with Keegan and Co as management and the team we had at the time. Since then we’ve only had Sir Bobby (RIP) in place, but he had the wrong set of players and an incompetent fool in charge. If we had had Bobby instead of Keegan first time around, I’m confident we would have won something. The timing has to be right with everything and it’s mostly down to luck and not judgement. Look at Man Utd, if they had sacked Sir Alex when they said they would, after his first or second season in charge, they wouldn’t have gotten anywhere near the success they have now. Lucky for them they kept him on. At the moment we have an owner no one wants, a management team no one wants and players people don’t know if they want or not! How are we supposed to be successful as a club if we as fans and it seems some players don’t buy into what is happening at NUFC right now? The best we can hope for is for someone new to buy the club, someone who will have a team of people in place who know football and can use their influence to bring a top drawer manager to the club. Until then we will continue to plod along with 2nd rate managers (Haughton included) and go nowhere. Hugh on a slightly different note, I was reading with interest your chat with Porciestreet on The Templars etc. Just wondered if you had visited Monsegur Or RLC, they have Templar connections (allegedly) amazing places. Also when I was on hols in Malta I asked my guide on a bus trip about Templars on the Island and she was quite vehement about any such possibility, although many believe the Hospitalers (spelling?) absorbed many of them to avoid the persecution. I wondered if they are told to deny any connections. i think that has more to do with the myth of us scouting via youtube & an attempt to right that thought over-process in the fans eyes/minds. kk was always gonna end in tears, & did. & that court process has mashed it up somewhat, hey? CH was obviously just a stop gap. But if the ‘moneyball’ approach works out & managers see that the club will do the business, if it’s right, that could change perceptions over time. There’s always the ex player i.e. Clarkey. Micky, when did the board ever say that they were going to sack him? I certainly don’t remember that. Also how can you describe a manager as “second rate” when they have only just started in management? worky, we have had theoretically good managers before, Gullit, Souness, Keegan, Daglish, SBR, Sam Allardyce, and were also apparently very close to aquiring Harry Redknapp. They all suddenly became bad managers at the toon. Would you say that was the fault of the club or the “goldfish bowl” affect ? I don’t think managers can be judged ‘good’ or ‘bad’ simply by how many titles/cups/honours they acrue these days. It has always got to be within the context of the club they’re managing and that club’s realistic expectations in terms of league finishing positions. Munich, answering your question would assume that I accepted all the points you had put forward as some kind of ‘given’. In other words it is a ‘loaded’ question. Why don’t they teach logic in schools? Worky, we all know that you don’t rate Pardew, but as far as the toon and managers go, we have been a basket case well before Ashley arrived. Which “good” manager would join the toon ?…the one that Ashley throws a load of money at by any chance ? Is that guaranteed success ? If so then why not stick with Pardew ? Ashley is not stupid enough to pull another Kinnear stunt….is he….?! Worky@45 it’s often quoted in the media, though perhaps it’s part of the “legend forming” of Sir Alex Ferguson, that he was in fact days away from being fired at Old Trafford due to a series of bad results. So Micky Toon @42 isn’t completely wrong in his statement, which you seem to deride. Munich, wouldn’t that assume that everything speculated in the media was true? I would suggest that most of us know that isn’t the case from previous, verifiable experience. I don’t recall any one from the hierarchy of Manchester United going on the record to say that Alex Ferguson was days away from being sacked, do you? It’s a textbook loaded question Munich. Why should I assume for instance that Bobby Robson was a bad manager at Newcastle United? Or that Newcastle United is the only major club to have a ‘goldfish bowl effect’ if indeed that cliche is true at all and so on. Worky, it’s not hard to find numerous stories on Alex Ferguson nearly being sacked via Google. Some of them say he was, the others, normally by club stooges such as Bobby Charlton say not. So, believe what best suits your own opinion. Houghton is second rate in the fact that he’s not exactly a top manager that the big clubs are clamouring over. In my mind he was never going to take us anywhere. Nice guy, would love to have a pint and a natter with him, but as for taking us where we would all like to be? I doubt he had the influence and the experience. The guy we have in place is arguably a better manager, I don’t think he is, but time will tell if his record is better than CH’s. Worky@53 said……..Munich, wouldn’t that assume that everything speculated in the media was true? I would suggest that most of us know that isn’t the case from previous, verifiable experience. Worky…regarding your media assumption absolutely not…. I’m not sure what a “loaded question” is to be honest. I like to hear opinions, if you want to tag my question as loaded you can do, but really I was just asking your opinion regarding the “goldfish bowl” affect. Also the term has been specifically applied to NUFC by one of our ex players (and not a very good one by the way).. Regarding the supposed imminent bladdering of SAF at Old Trafford, Micky Toon @55 kindly offered up some links backing up the same theory which I was referring to earlier. That’s exactly what I mean Micky, tittle tattle from people who now nothing, if that, is treated as if it were fact. However, when someone of great repute who knows the club as well as anyone denies it, ie Sir Bobby Charlton, he is written of as a “stooge”. Surely you can see that is upside down? I must admit I’m not really sure about the “goldfish bowl” effect. If by that it is meant that we’re under the microscope in how we perform on the pitch, then I think there are clubs that suffer from the “goldfish bowl” effect a lot more than us. I think where we are a “goldfish bowl” is when it comes to soap opera-like off-the-pitch nonsense we seem to generate for the media’s entertainment. In the case of yours, it would assume that I already agreed that all the managers you stated were “good” managers before they joined the club, suddenly became bad managers as soon as they joined NUFC, that Harry Redknapp was very close to joing Newcastle United whe he himself said that he didn’t want to as soon as he saw how the club worked, and that the reason for the previous assumption which I may not agree with was due to the another idea, ie Newcastle United as a ‘Goldfish bowl’ which I also may or may not agree with too. Even if I DID agree with all of those things above, it would still be a loaded question Munich. Charlton is a stooge as far as I’m concerned. ManU can’t do any wrong in his eyes, no matter what happens good or bad. Check the last line for the correct pronunciation. No sources, quotes or anything like that apart from the word ‘agent’ though. well it ain’t from a rag so i thought it would slightly more validity. & it seems that they could well have spoken to someone related, as they’ve obviously been corrected about the pronunciation. One player lifts a gooner up by his shirt & we’re charged. Does a team always get charged for that? Cos i don’t remember it happening before. scunny ( ;) ) game on tv. One site, that will remain unnamed, reckons we’re not in for bentner. Clint, as I’ve said in my articles, I’d be very surprised if we were in for Bendtner. Check out the bull injuries at the ‘bottom’ of the page. Can’t beat a bit of bully! Just for all you Maiga watchers, if you read the french site for Sochaux , it appears they have issued the player with a ‘ Contractual Warning ‘ if he fails to agree to play again he could be fined etc. in France it is a tiny bit different to EPL , where you just tweet you want a move and Roberts your uncle vamoose in come liverbin raiders and take your player ! Maiga might have to sit oot a few games get a few bottles thrown at him from the stands before he arrives at St James ! and the french will know only so many days left on the transfer window, they have offered him a new contract !